Have you had a chance to attend one of Medisolv’s webinars about eCQM reporting in 2016? This webinar, appropriately titled eCQMs 101, is all about the basics of Electronic Clinical Quality Measures (eCQMs). 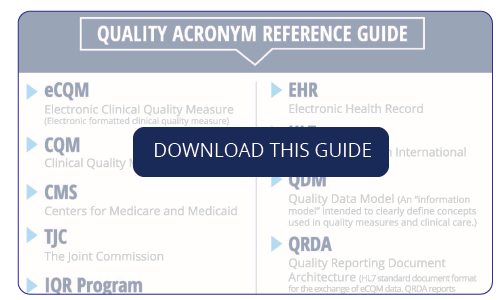 We review how an eCQM is calculated and the steps to implement an eCQM in your hospital. You’ll also learn how to analyze your results for your best submission to the CMS Inpatient Quality Reporting Program. In the webinar, we reference the Quality Acronym Reference Guide. You can download that guide right here.